Pink and Coral – Who would of thought? Every couple of months I get rid of almost everything in my makeup bag and set off for my favorite type of shopping; makeup shopping! I am usually super classic with my choices, sticking to my favorite brands depending on the product. I am a sucker to liquid eyeliner and the cat eye effect, and I use one of two brands either YSL Shocking liquid liner in black, and recently I have switched to Make Up Forever Aqua Liner in black; both are as equally easy to apply and last all day. I usually do not apply concealer to my face unless I am going out at night. I like to let my skin breath and stay natural as much as possible, and like I always say; your skin damage is irreversible so leave it natural. Recently I was travelling and went to the duty free at the airport to waist some time and realized that almost all makeup brands have introduced rather flashy colors in their blush palettes! I mean who would ever think of applying orange or hot pink blush? But do not get fooled like I did. The sales representative was kind enough to show me exactly how these colors are applied, and trust me they look nothing like they do sitting in the palette. The most essential step is moisturizing your skin prior to the application of any blush. Rest on it a bit and wait for your facial cream to dry and settle before you get started. 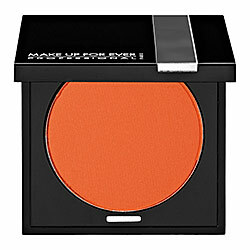 I happen to have olive skin, so my suggested shade is more towards to the hues of orange and coral. For whiter and paler complexions, shades of pink and tints of red are best. Apply some powder to your brush and dab it on your hand to get rid of any excess color. My trick is to put your head down and go back up, where your cheeks have flushed is exactly where your powder should be applied. With striking colors as such, the steps are to keep adding minimal amounts till you reach your final and desired color. If you feel the color is too concentrated, use a small amount of concealer to spread it around evenly. Et Voila! The color in the palette looks nothing like it does once it is applied. If you have olive or dark skin stick to shades of orange and coral, for lighter skin your color is definitely in the pink family.